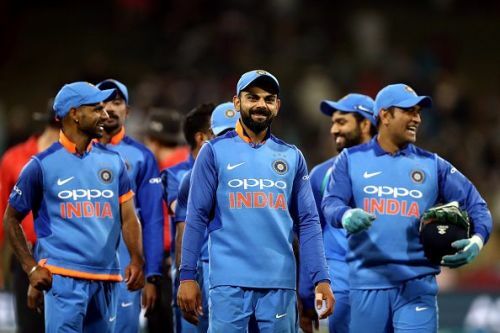 India's 15-member squad for the 2019 World Cup has been announced. The Virat Kohli led-team was announced by Chairman of Selectors MSK Prasad on Monday. India became the third team after New Zealand and Australia to submit their 15-man list. The World Cup begins in England and Wales on 30th of May. Ambati Rayudu, whose name was constantly floating for the No.4 spot, has been left out, while KL Rahul, who has been in sensational form with the bat in the ongoing IPL 2019, made the cut. All-rounder Vijay Shankar, who rose to prominence in limited-overs series against Australia and New Zealand earlier this year, has been slotted in for the No.4 slot. "We also have a role for KL Rahul somewhere at the top. To begin with, he'll be a reserve opener. Depending on the team, we'll look into his role further," MSK Prasad told the media after the announcement. Along with the experienced MS Dhoni, who will be playing his fourth World Cup, the side has Dinesh Karthik as the secondary wicketkeeper. Rishabh Pant does not make it to the squad. "Pant is full of talent. He has a lot of time (in the future). It is unfortunate that he was left out. One of the wicketkeepers will play only if Dhoni is injured. We have seen Dinesh Karthik play well under pressure situations, which is good for him," Prasad said, on the wicketkeeper's slot. Ravindra Jadeja occupies the third spinner's spot, along with Yuzvendra Chahal and Kuldeep Yadav. In the pace bowling department, Jasprit Bumrah leads the list, with Bhuvneshwar Kumar and Mohammed Shami for company. "I don't think we really went with IPL form. Other players have been fantastic. Shubman Gill batted well, so did Prithvi Shaw. So we did not consider it", MSK Prasad added. Four additional medium-pacers will travel along with the team.